Serious concerns raised about Iran falling back on weapon’s programme. 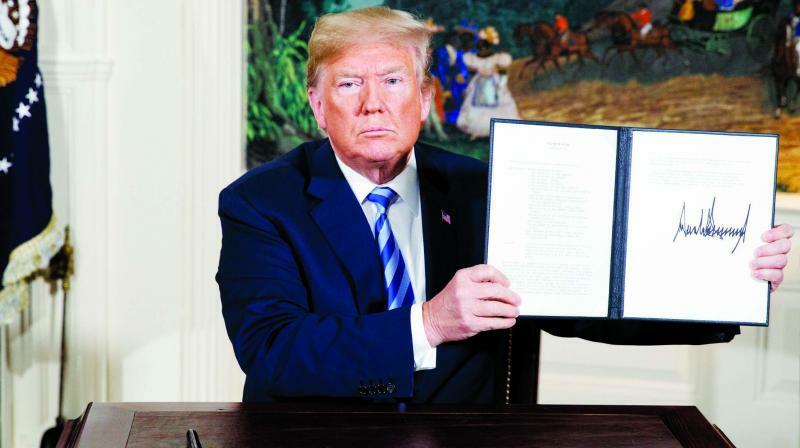 Acting on his campaign pledge, US President Donald Trump decided to withdraw from the US-Iran nuclear deal, also known as the Joint Comprehensive Plan of Action or JCPOA. It was termed “insane”, “horrible” and “one-sided” by Trump during his presidential campaign and even after taking over as president. Mike Pompeo, the secretary of state, has backed Trump on the treaty and called Iran the “biggest sponsor of terrorism in the world.” It seems that President Trump believes that harsh words and tough posturing are effective diplomatic tools. The obvious intent of the JCPOA was to stop Iran from acquiring nuclear weapons. If it had been fully implemented, the constraints put on Iran and the verification process would have ‘prevented’ it from acquiring nuclear weapons. The deal expected the Iranian government to abide by three key things – to reduce the centrifuges used to process uranium, slash the stockpile of enriched uranium by 98 per cent and cap uranium enrichment by 3.67 per cent, enough to keep nuclear power plants going but inadequate for making a nuclear warhead. This was besides the condition that Iran would abide by the demands of International Atomic Energy Agency to inspect the nuclear establishments as and when they desire. As a quid pro quo, all international sanctions against Iran, the fifth largest exporter of oil, by US and other countries, were lifted and Iran’s economy, which had suffered all these years, was able to revive and come back to its feet. The withdrawal will impact the politics of West Asia, relations among major world powers and international economics as well. The credibility of US as a responsible world power will be further questioned. It has also thrown up an entirely new kind of situation for allies in Europe and West Asia. While both Saudi Arabia and Israel have welcomed Trump’s decision to come out of the deal, the European powers issued a statement expressing “regret and concern” over the development and their “continuing commitment” to the deal overseen by them. The US has not proposed any alternative to this deal. There are many concerns that are being flagged, the biggest being that Iran may fall back to its weapons programme. President Trump has also created a situation where Iran will build better relations with Russia, China and Europe to carry forward the deal. Israel is already on alert for a possible conflict with Iranian interests in the region. President Trump will likely discover later, that a completely coercive action is less effective than a multilateral approach accepted by the rest of the world. The US action will also put the opening up of American Embassy on May 14 in Jerusalem in a different light.